At the end of my last post I asked the question, ‘what about those folk who have grown up in a Christian home and church environment and who have never consciously made a response to the Gospel – are they “saved”’? I am sure most Christians have at some time heard the statement that just because you live in a garage does not mean that you are a car. But why is it true that someone brought up in a Christian environment, and who conforms to the outward norms of Christianity, is not necessarily saved? Ever since the enlightenment, and particularly since the reformation, the distinction between mind (soul) and spirit has become blurred and even non-existent. The early church theologians regarded human beings as triune creatures comprising body, soul, and spirit. However, modern theologians see human beings as dualities or even modalities – creatures comprised of a physical and a non-material aspect (spirit/soul) or beings where these aspects are so integrated that they constitute an undifferentiated whole. As a result of this type of thinking, many Christian teachers regard ‘salvation’ essentially as a change from one way of thinking to another. So, the presentation of the Gospel becomes a reasoned argument and a persuasive exercise, and salvation itself is seen as more an act of the human will than a supernatural act of God. Yes I know I might be oversimplifying things and that most evangelicals would not accept that they might be thinking this way. However, I do think that this is a definite underlying problem in much of today’s church. It is true that we need to change our minds about ourselves, God, and the need for salvation; this change of mind and heart is part of what we label ‘repentance’. It is also true that we need to exercise our wills to accept what Jesus has done for us and to ask him for a new spiritual life. However, and this is a huge ‘however’, this is only the small ‘manward’ side of salvation, the simple response to what God has done and what he offers to do for us. The two overwhelmingly major components of our salvation are firstly what Jesus Christ did on the cross of Calvary to make our salvation even possible, and secondly what the Holy Spirit does in creating a new spiritual life within us. This miraculous act of creation is called the New Birth. Jesus said to Nicodemus, “I tell you the truth, unless a man is born again, he cannot see the kingdom of God” (John 3:3), and again, “unless a man is born of water and the Spirit, he cannot enter the kingdom of God” (vs. 5). Yet again Jesus said, “You must be born again.” (vs. 7). A baby cannot be born without an actual, and most times traumatic, birthing experience. Babies do not slowly materialise until one day the surprised mother says “O look! It seems we have a child!” In similar fashion to be born again of the Spirit is a definite and momentous event – it is supernatural creative miracle! I have written this post not just to answer the question concerning people who grow up in Christian environments but to draw attention to the deeper issue of recognising the new birth of the spirit as an essential and definitive Christian experience. Do you have any thoughts on this? If you do I would love you to comment on the blog. I think that you are correct in identifying the modern western problem of identifying conversion with a change of what one thinks. This has had major consequences and we are all affected by it in one way or another. It might also be worth pointing out that for the early Fathers the mind and reason was not the same as what modern thinkers have understood by rationality, but had a more contemplative and intuitive element. However, as an Orthodox Christian, what I find jarring (or perhaps just contradictory) in this post is the assumption – if I understand you correctly, and assuming that that is what Evangelicals believe – that salvation and “rebirth” is a once off thing. As you note, birth is a traumatic event. Everything that you seem to be saying here suggests a life-long process – that is certainly how I understand a life of repentance, the renewal of the mind – which is far deeper than changing of our minds in terms of modern rationality – the learning to see the light of Christ. I just don’t understand how that sits with seeing salvation as a once-off decision. I, for one, need at least a lifetime! I grew up in a christian home and we went to church most sundays, but it was more a social event that seeking God s face for me. I left home and for a very long time the only time I went to any church was weddings and funerals. I got to a real low point in my life and made a choice to invite Jesus into my life. I made a choice for Jesus and did repent of my sin, but in many ways I still had a worldly view of God with a lot of baggage. In real miraculous ways God have shown me the power of prayer and many other aspects, through my wife and other followers. I think it boils down to a personal choice to follow Jesus and as Jesus said to Nicodemus you can not experience “see” the gorly of the Kingdom of God that leads to strong Faith before you have made the choice to invite him into your life. You need to have some understanding of who God is before you can make a choice like that. In revelations Jesus say ” I sand by the door knocking” he will not force his way as that is contrary to free will and the choice to follow Him. If it was that simple God would have just created us as such. The prayer of the waiter is like me sitting in a church with my mother and father going through the motions where I have prayed the prayer probably more that once and honestly don’t even remember. I may be wrong but I think saving souls is not done by one individual getting a person to pray the prayer but a combined effort by the body of Christ, and please correct me if I am wrong but feel it wrong to count people that got saved like sheep. like a badge of honor. Ultimately it is God working through us and I feel it would be wrong of me to keep a tally, because then it is about me and not God, and that is only the beginning. That saved soul still have some strongholds to work through and do need guidance and to a large degree patience from other followers and it is at that time that we as followers can cause more harm than good. I think every persons path to salvation is unique, and there is no set recipe. In my life it was true followers around me that lead as example that got me to a point that I wanted what they have and it was people from long before I got to that point as well. One example is a couple that retired in Ladygrey, but spend most of their lives as missionaries in South America. In a turbulent time in my life I enter there home as a un saved person, and experienced an amazing feeling of peace and well being. Some thing that I did not understand nor could explain. They were but one of few people that came across my path, and I wanted what they have. Thank you for your comments and observations Macrina. I am indeed an evangelical theologian and my particular understanding is that ‘salvation’ is a word that describes a process. The point I was attempting to make in my article is that the definitive first part of this process is the ‘rebirth of the spirit’ to which both Jesus and Peter refer (JN 3:7 1 PET 1:23). 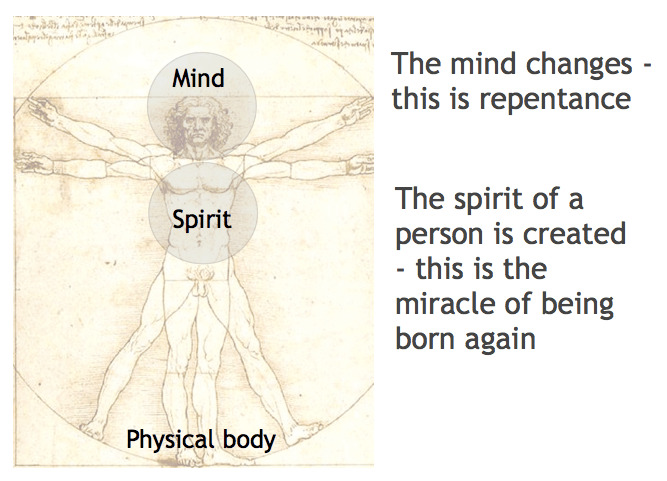 I do not believe that the phrase ‘born again’ is a euphemism for ‘decide’, or a strangely inappropriate reference to a life-long process of transformation. In theological terms the rebirth experience is usually referred to as Regeneration. Wayne Grudem, a well-respected evangelical theologian of our day, writes that ‘it is right to conclude that it is an instantaneous event. It happens only once’ (Grudem. W ‘Sytematic Theology’ Pg. 701). The life-long process of transformation (ROM 12:2 2 COR 3:18) is generally known as Sanctification, and the ultimate resurrection of the body is Glorification. The process of salvation therefore consists of regeneration, sanctification, and glorification: It starts with regeneration and ends with glorification. All three elements are essentially works of God, but we have limited but distinct roles to play. We need to repent, believe etc. before we can be born again of the Spirit, and we need to trust and obey in order to be sanctified. To put it another way, we are ‘saved’ spiritually when we are born again of and by the Spirit of God in the name of Jesus, we are ‘saved’ soulishly/mentally as we are progressively transformed by the Word of God and the Spirit of God into the likeness of Jesus, and we are ‘saved’ physically when we are ultimately glorified at the resurrection. Thank you too Anonymous for sharing your personal testimony. I think that my response to Macrina (above) may also adress some of your observation. May God bless you both. Kindest regards.